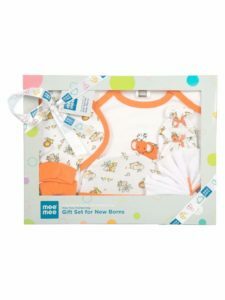 Amazon- Buy Mee Mee Pampering Zoo Print Gift Set, Orange (Pack of 6) at Rs 387. It comprises one t-shirt, one bibs, one napkins, one bonnet cap, one pair of booties, one pair of mittens. So, Hurry up!! and seize it.